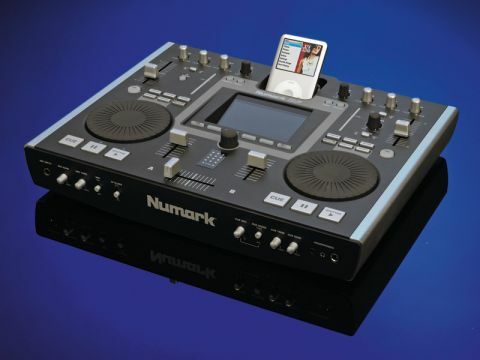 Numark's iDJ2 takes over from the iDJ, the first iPod mixing console to cross our tech radar back in 2005. That first iDJ console lacked many features that a proper DJ would call essential, and basically just brought DJ fun into teenage bedrooms across the land. The iDJ2, while still toy-like, brings in things like beat matching, pitch control and scratching - all of which worked well for us - and correspondingly makes the console a more fit-for-purpose club tool for beginner DJs. At the head of the console is the single iPod docking bay. It has a screw slide and tray to firmly grip the iPod. You no longer need two iPods to play two track, thanks to a new caching system. The first time you dock an iPod into the iDJ2, it needs about 20 minutes to take a snapshot of the library so it can remember the iPod's profile. You then use the six illuminated buttons below a generously-sized colour LCD screen to browse for tracks. The caching is accessed using the 'crate' feature, which lets you bring in plenty of tracks onto the iDJ2's local memory. This is a world away from the clunky iDJ. Single button clicks and a scrolling knob make using the LCD very easy. Pitch control and scratching are also new to this version and work well. The volume controls, pitch, LCD screen, jog wheels and outputs are all good quality. The pitch can be altered using the menu system to give it a wider range. There are loop buttons, too, should you need them. The connection options are great. Two USB ports let you attach external storage to the iDJ2, so you could store your tunes there. You get twin turntable and line inputs for peripheral decks, and reasonable bass, treble and high controls on both the channels and master output. On the downside, the price feels £150 over pitched. It's a big jump from the iDJ's price tag, and you could always plug your iPod into a standard mixer for the price of a connecting cable. Also, the earphone controls are poorly placed on the front lip and take some getting used to. The cue volume knob is also too small and fiddly. Overall it's clear that Numark listened to the complaints about the first iDJ and made a concerted effort to make iDJ2 more viable. It's reliable, well featured and good fun to play with, but at a price beyond the means of its target market.